This day belongs to IsaLaBelge. "You're doing a great job, Sheena! Love from Belgium, Isa"
Give it up for the G train and this funk classic. 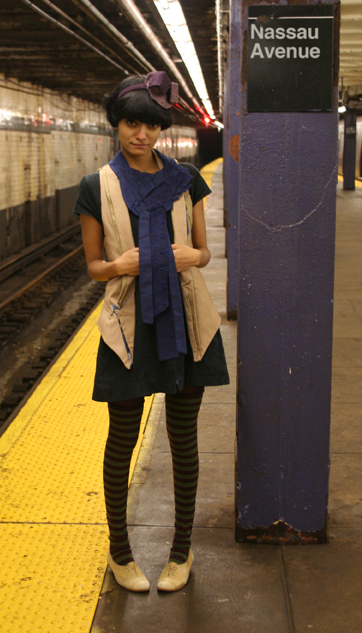 Handmade vest, necktie and headband designed by the lovely Hartefactos gals. See more detailed photos on their flicker stream. Thigh highs from Sockdreams and vintage oxfords from eBay. This is an amazing concept. I'd like to pass this along to all my friends and followers. Liiinda, Amo completamente seu estilo. the nassau stop does get funky as the weather warms up, doesn't it. funky nassau is an all time hip hop great. kool herc and afrika bambaataa will be proud. fantastic pieces pull this outfit together; totally wearable, completely individual. amazing. this is totally an outfit i would wear :). Our youth have so much that I think we can give a little to India and other countries that can use a hand out. I love the classic shoes with the out-there socks. those shoes! that vest! i can't believe there's only five more days!! Payal tagged this On the funky track! Did you imagine 360 days ago, you'd create such a global movement, and send 209 kids to school? It's inspirational because so many people don't know where to start. Guess it all starts with doing what you do best, whether it's fashion, art, writing or performing. And talking about fashion, for the 360th time, babe you've nailed it! I LOVE your project!! I introduced it in my blog. I wrote it with the story from the traditional Hawaiian canoe called "Hokule'a" I sail with. We navigate by the stars and waves. We can take a few belongings (one cooler box), but the life on the canoe is so rich... http://kanauchi.exblog.jp/10492201/ (has 1000+ readers from Japan) my english site; kanaphotography.com wishing you & your project for the best! Over 75k - do I here a woop woop?? very cute! i love the headband. Ahhhh, my favourite subway stop of all time! I love reading the 'customised' movie posters on the walls. One in particular springs to mind - Pic of Will Smith in 'I am Legend' with a script that said The Last Man On Earth Is Not Alone....to which someone had appended in a scrawl HE HAS A DOG! Oh, am gonna miss this, Uniformproject!!! Sancha Livia tagged this amazing! Acompanho vc desde o início. Achei sua ideia espetacular. Torço para que vc tenha alcançado seu objetivo.Parabéns! how very inspiring. thank you! i can't put my finger on it but something about this outfit just works. super cool. love the necktie - what a way to dress up the Uniform & make it more unique. You look a little forlorn - like, "Where am I going next?" Everything looks cute on Sheena. loving everything about today's look - amazing clothes against an amazing backdrop. The first picture isn't at the Nassau station. The platform is in the middle and the trains are on the side. 21st Van Alst and some photoshop maybe?